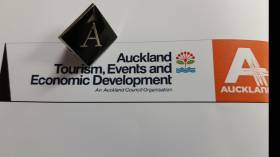 Some of our team members are Tamaki Makaurau Auckland Ambassadors and have done a course designed for people engaging with international and domestic visitors across Auckland. The aim is to create storytellers and ambassadors with real pride in Tamaki Makaurau in Auckland. We had an awesome fairy themed day this week! 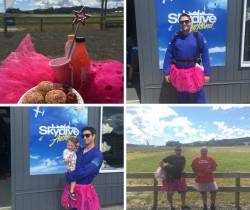 Those who had raised the $600 target to raise money for 4 year old Aucklander Ella, were treated to a 13,000ft skydive. Ella was here too and watched as fairies actually came down from the sky. Brilliant day and well done to everyone who took part. We are extending this fundraising cause until the end of March 2018 - so sign up NOW! Ella was born at 25 weeks weighing 800 grams and was given a slim chance of ever leaving hospital.She has life long conditions: Cerebral Palsy, Hydrocephalus and Epilepsy. Ella has been selected to undergo Selective Dorsal Rhizotomy (SDR) at St Louis Children's Hospital in America. 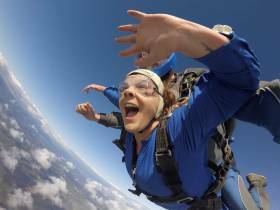 Sarah from Baby Loss NZ faced her biggest fear - jumping out of a plane - during Baby Loss Awareness Month to help parents face their biggest fear and raise money for this cause. 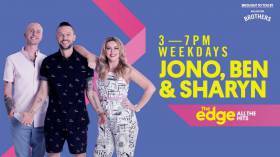 Due to lack of funding, the number of families that Baby Loss NZ were able to help this year has dropped significantly and it was great to welcome Sarah to Skydive Auckland to help her fundraise and this video clip was shown on TVNZ Newshub Click here to see more and watch the video. 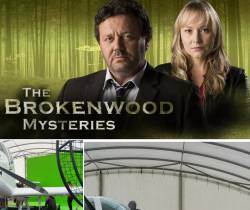 Anyone watch The Brokenwood Mysteries recently? We were asked to film the skydiving stunts so you will see our awesome staff featuring in an episode!